Adam Duffy admits he is fed up with his inability to win a deciding frame after his UK Snooker Championship fairytale came to an end at the second-round stage on Saturday. The Sheffield amateur caused one of the biggest shocks in UK Championship history by beating two-time champion Ding Junhui in round one but couldn’t follow that up, as Joe Swail triumphed 6-5. Duffy gave the veteran Northern Irishman as good as he got at York’s Barbican Centre with both players having chances in most frames but Swail eventually got over the line in a tense decider. The 26-year-old did make an impressive 71 break in frame nine – and recovered from 5-3 down to force a final frame – so says the positives are there despite his disappointment. “I’m a bit gutted to lose that 6-5, at the minute I just can’t win a decider. I’ve lost about eight on the trot I think,” explained Duffy. “But I’m playing well, the table wasn’t the best for both of us, but it is what it is and you’ve got to get on with it. “I’m happy with how I’ve done, I’ll take beating Ding obviously and just take that into the next tournament. “I try not to put too much pressure of myself but just the way the balls are falling at the minute, I can’t win a decider. Duffy was on the main tour from 2011 to 2014 before dropping off after, by his own admission, not practising hard enough. He will try to once again earn a tour card at the end of this season but as an amateur he acknowledges that the difference in prize money between £4,000 for losing and £9,000 for winning against Swail did cross his mind. 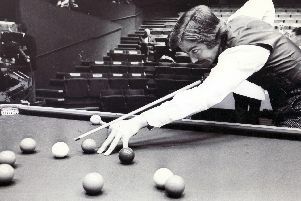 “I was thinking when he was breaking off, this is for four or five grand, this one frame, but that soon went out of my head and I got on with the snooker,” added Duffy. “I’m gutted to have lost but it’s onto the next tournament again.